Spending $1 million (Dh3.7 million) on property can buy you different configurations of homes in cities across the world. According to a report from Knight Frank, $1 million buys you only a diminutive 17 square metres, or 183 square feet, in Monaco, the world’s most expensive real estate market. Hong Kong ranked second, with $1 million buying you only 20sqm, or around 215 sqft. In New York, you’ll get a bit more for $1 million – 26sqm or 279 sqft. In comparison, Dubai luxury real estate is way more affordable. $1 million can get you a palatial 162sqm or 1,743 sqft. Among global cities, only Sao Paulo (176sqm) and Cape Town (209sqm) real estate are cheaper. Dubai luxury real estate is also more affordable today than in 2016 and 2015 when $1 million could buy you 155sqm and 145sqm, respectively. “For $1 million, we can buy a full range of properties, starting from luxury apartments of three+ bedroooms in Dubai’s premium areas such as Palm Jumeirah, Dubai Marina, Downtown, Dubai Harbour Creek and Citywalk. In the townhouse/villa segment, we can get decent off-plan properties in Dubai Hills, Mudon and Jumeirah Park,” says Sanjay Chimnani, managing director, Raine & Horne Dubai. According to Chestertons, $1 million can buy a one-bedroom apartment in the Burj Khalifa or a two or three-bedroom apartment in Downtown, Palm Jumeirah and Dubai Marina. With regard to villas, $1 million can buy a three-bedroom villa in the Lakes, the Greens or Arabian Ranches. In communities such as The Villa or Akoya, $1 million can buy a five-bedroom villa. “Currently, there are a higher number of ready-to-move-in properties available for $1 million compared to those off-plan. 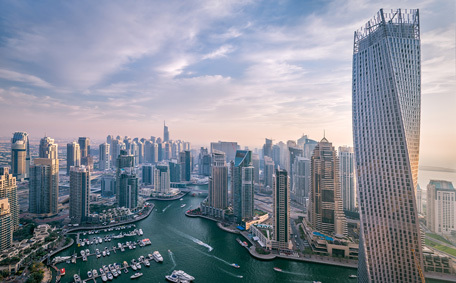 We have, however, recently seen several prime location developments announced, together with branded residences, adding options in this price bracket,” says Ivana Gazivoda Vucinic, head of advisory and research, Chestertons Mena. However, the average ticket size for residential transactions in Dubai is approximately $500,000 (Dh1.8 million) and most of the transactions are in this range. “Transactions are predominantly in the $500,000 to $650,000 end of the market. They involve apartments in premium locations, but smaller sizes, more the one- and two-bedrooms. Townhouses in the same price range have also had some good movement. These are in areas such as Nshama and Mudon,” adds Chimnani. Commercial and retail properties are also available across Dubai for $1 million and above. “A number of large project announcements has inspired buyers with multiple choices of properties across size, budget, location and completion dates,” says Kalpesh Sampat, COO of SPF Realty. Many buyers have a threshold of Dh2 million to Dh3 million or maximum Dh3.7 million ($1 million). Meanwhile, in Abu Dhabi, $1 million can buy a 2,760sqft apartment or a 3,745sqf villa. “You can buy a sea view four-bedroom apartment in Al Raha Beach, a two-bed apartment in St Regis, three-bedroom in Saadiyat Beach Residences in Saadiyat Island, four- and five-bedroom villa in Al Raha Gardens or four-bedroom villa in Aldar’s off-plan development Yas Acres,” says Ozan Demir, research and data manager, Reidin.